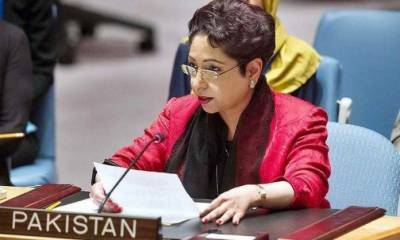 New York, (Web Desk): Pakistani envoy and ambassador Maleeha Lodhi reminds UN its responsibilities to address Kashmir issue in a large gathering of Kashmiri and Pakistani community leaders in New York, the sources reported. Accorduing to details, on Friday at Pakistan House to mark Kashmir Solidarity Day, Ambassador Lodhi said, the Pakistan’s main aim and task to the United Nations serves as the voice of the Kashmiri people on international level. She said, "We are the voice of the people of occupied Jammu and Kashmir here," adding that Pakistan is fighting the case of Kashmiri people at the international forum on the basis of irrefutable moral and legal grounds. Speaking at a meeting she said, "Today I briefed the President of the Security Council, Gustavo Adolfo Velasquez, on the grave situation in occupied Jammu and Kashmir." The Pakistani envoy told the gathering about the escalation of ceasefire violations along the Line of Control (LoC), which pose a 'serious threat to global security and peace. The Pakistani envoy also reminded the UN of its responsibility to address the grave issue of Kashmir violations that has long been on the UN agenda but Security Council resolutions and promises to the Kashmiri people remain unimplemented. "The Kashmir issue will remain alive at the UN until it is resolved according to the wishes of the people of Kashmir and UN Resolutions," she added. The freedom movement of the Kashmiri people has entered a new phase as the Indian atrocities in occupied Jammu & Kashmir have crossed all limits of barbarism Ambassador Lodhi argued. "This is manifested in the unprecedented resistance being offered against the Indian occupying forces." In their latest wave of oppression, Indian occupation forces martyred more than 20 innocent Kashmiris in a brutal crackdown on 1 April. Indian soldiers also opened fire on funeral processions and peaceful protests, injuring over 200 Kashmiris. Expressing unwavering solidarity with the people of Kashmir, Ambassador Lodhi said that the BJP government could never succeed in suppressing the Kashmiri freedom movement. "Until Kashmir is liberated from Indian occupation, our moral, political and diplomatic support to the Kashmiri people will continue," the Ambassador declared. Pointing to the unparalleled brutality and casualties of innocent Kashmiris in a single day in occupied Kashmir, she said that this testifies to the readiness of the BJP government to go to any lengths to suppress the popular uprising for freedom. Earlier, Pakistan Consul General in New York, Raja Ali Ejaz, also expressed Pakistan's solidarity with the people of Kashmir and urged the audience to make contacts with American politicians, lawmakers and common citizens to apprise them of the deteriorating situation in Jammu and Kashmir. The meeting started with the recitation from the Holy Quran. A video message of Mashaal Malik, wifeof the chairman of Jammu & Kashmir Liberation Front, Yasin Malik, was also shown on the occasion. The meeting concluded with a 'dua' for Kashmiris who were martyred by the occupying forces.